There are so many things that the United States is famous for – Such as internet, Hollywood, large companies, top universities and powerful military. U.S is also home to many surreal places you need to see to believe. The followings are 10 of the most surreal places in the United States. The fly geyser is an amazing geothermal geyser located in the Northwest of the Black Rock Desert in Nevada. 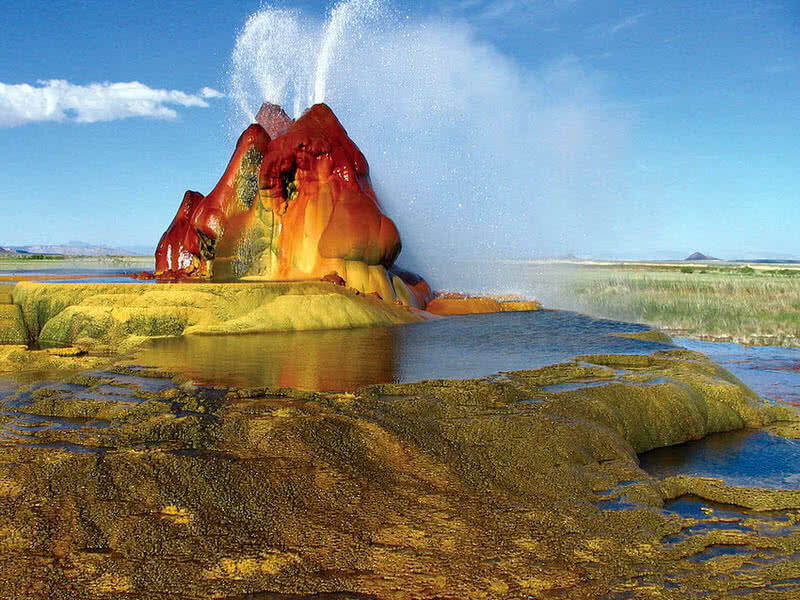 To your surprise, the fly geyser is not a natural geyser. This amazing geyser was created accidentally when a geothermal company drilled a test well at this site. Back in 1964, a geothermal company drilled a well on the private fly ranch located in the Northwest of Black Rock Desert, to find geothermal power. They found the underground water on the site is not hot enough for a geothermal plant. So they abandoned the project and left the well uncapped. The site is still a private property, owned by Todd Jaksick. Gradually, the hot underwater began to rise from the weak spots of the well. The constant release of mineral rich water also results in the formation of limestone mount on the site. The limestone mount is still growing by the continuous deposition of minerals. The presence of thermophilic algae also gives brilliant red-blue coloration to the mounts of the fly geysers. The magical Mendenhall glacier is located in the Mendenhall valley in Southeastern Alaska. It is a 12-mile long glacier and a part of federally protected 2353 hectare Mendenhall recreational area. The Western part of the glacier is home to a numerous of breathtaking ice caves, formed from the melting of glacial ice water. 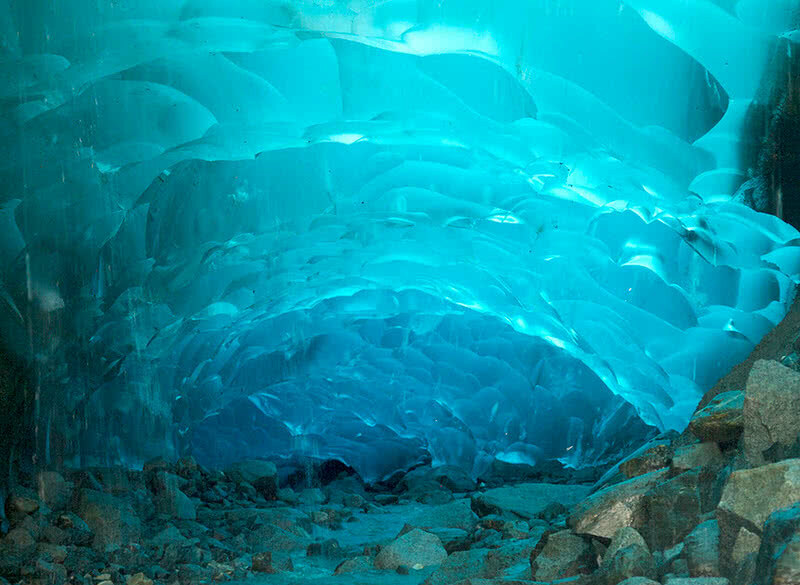 To access the ice caves at the Mendenhall glacier is quite challenging. You need to take a kayaking and ice climbing to reach these glacier caves. But it is worth seeing. These caves overall have transparent roofs and a brilliant blue coloration. They will shine in the sunlight. The condition of these ice caves can’t be guaranteed. It is risky to visit the ice caves in the summer season due to the movement of caves. The Haiku stairs are a steep, forbidden hiking trail situated along the Ko’olau mountain range in the Oahu Island of Hawaii. This surreal hiking is also known as ‘stairway to heaven’. Haiku stairs truly deserve this name because of the amazing panoramic view it offers. Since 1987, it remains closed to the public. The Haiku stairs were originally built during World War II for U.S militants to access the radio stations at the mountain top. In the 1950s, the original wooden steps were replaced by the metal steps. 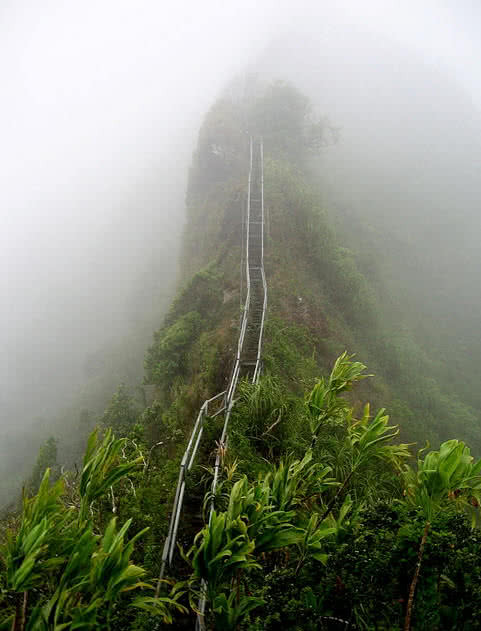 In the past, The hikers used to climb 3955 steps of Haiku stairs to ascend to 2120 ft. high mountain range. You can see ‘No Trespassing’ signs at the starting point of the trail. Still, many hikers continue to access this trail because of the breathtaking view it offers. Sadly, a powerful storm that swept the Oahu Island in February 2015 cause significant damage to the Haiku stairs. The reconstruction can be hard and now it became completely unusable. You may think Bryce Canyon is an amazing canyon as its name sounds so. But it’s not a canyon. Bryce Canyon is an incredible National Park in Southwestern Utah that renowned for its geological formations called ‘Hoodoos’. They are thin spires of rocks formed by million of years of weathering and erosion. 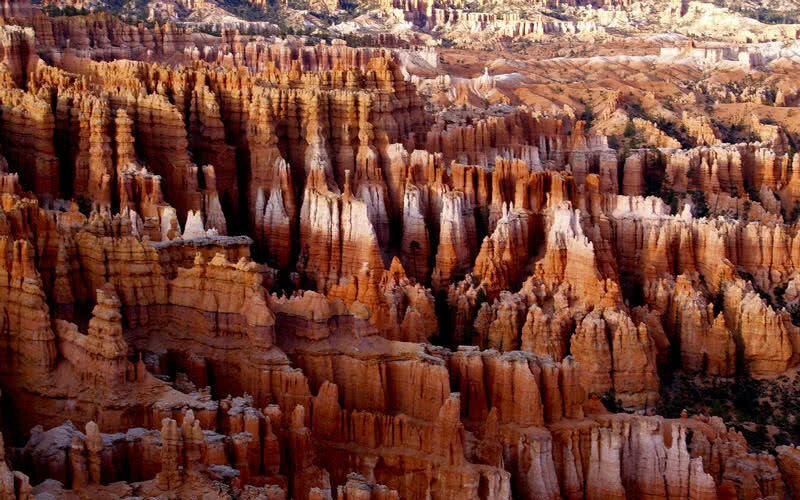 The Bryce Canyon National Park is home to such thousands of ‘Hoodoos’. The Bryce Canyon National Park covers a vast area of 35835 acres. The thin rock pinnacles (Hoodoos) of this National Park rise to 200 feet in height. They display brilliant red, orange and white colors. It is truly a jaw-dropping view for the visitors. Hiking is the best way to enjoy the Bryce Canyon National Park. The natural amphitheatre of this park extends for more than 20 miles. During Sunset and Sunrise, the entire park immersed in a dramatic coloration. Besides its breathtaking geography, Bryce Canyon is home to more than 5000 years old bristlecone pine trees. This National Park is also one of the best places in the United States for star gazing. Just think, how it feels like when you surround yourself with 300 acres of brightly colored tulips? feel like heaven isn’t it? well, if you want to visit such a surreal place, just attend the Skagit tulip festival in Washington. It is a magical flower show held every year in the month of April in the Skagit Valley in Washington. Every year, the Skagit Valley tulip festival receives more than million visitors from around the world. Undoubtedly, tulips are one of the most beautiful flowers in the world. In the Skagit valley tulip festival you can see thousands of different species of tulips in bloom. 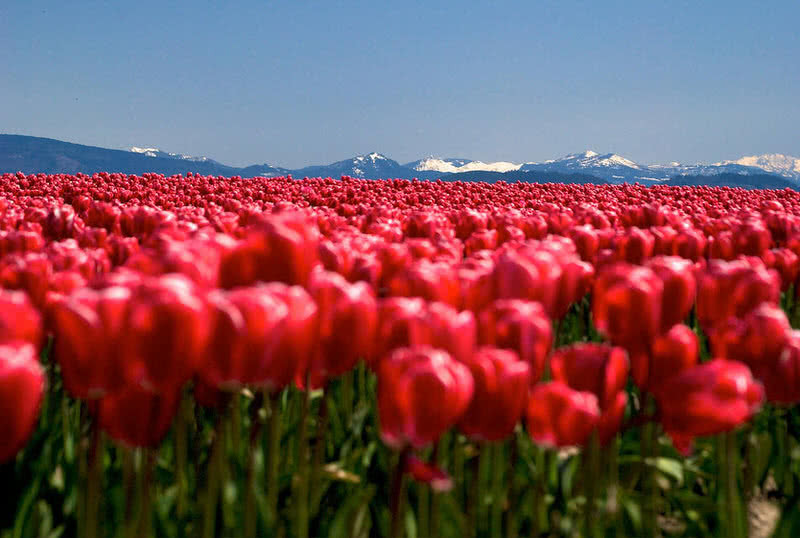 The vast fields of colorful tulip flowers against mount baker backdrop definitely will leave you breathless. In addition to colorful blooms, the tulip festival also offers art, cultural and concert shows for its visitors. 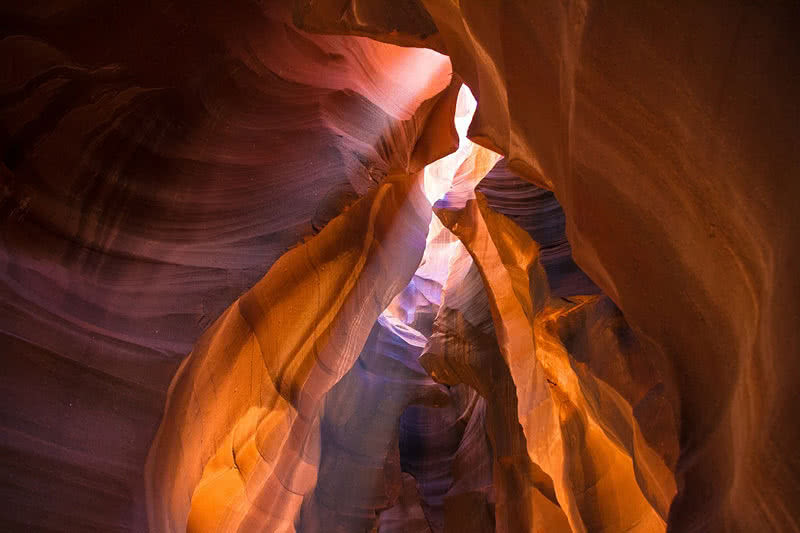 Antelope canyon is among the most beautiful natural wonders of Arizona. This amazing slot canyon located in the Navajo territory of the state. Antelope Canyon is probably the most beautiful and most photographed slot canyon in the world. This canyon is renowned for its wavy sandstone walls and narrow passages. The antelope canyon includes two different sections – upper antelope canyon and lower antelope canyon. The upper antelope canyon is the most frequently visited section of antelope canyon. It is because of the easiness to access the upper antelope canyon. You can also see the beam of light comes from the opening above the upper antelope canyon. In summer, this section also looks more colorful. The lower antelope canyon located few kilometers away the upper antelope canyon. You need to climb down along the pre-installed stairs to access the lower antelope canyon. Its paths are also narrower compared to the upper antelope canyon. But the rock formations at this section is just incredible. Horseshoe bend is a breathtakingly beautiful meander located near the Page city in Arizona. 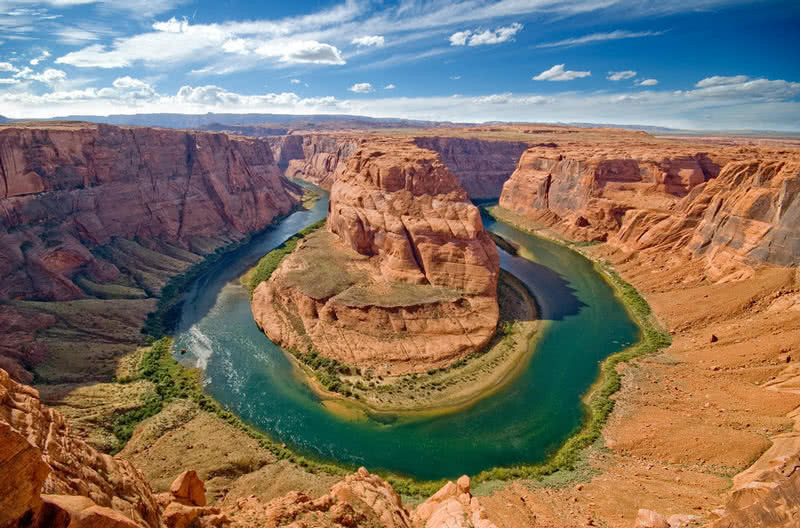 Horseshoe bend is named after its horseshoe like shape. It is just 5 miles from the beginning of Grand Canyon National Park. This magical place is carved down by the Colorado river in a horseshoe like a shape. So, horseshoe-bend is definitely a wonder and a don’t miss place of Arizona. Situated at an altitude of 4200 meters above sea level, the horseshoe bend make 1000 foot drop to the Colorado river. It’s only take a ¾ mile hike from U.S Route 89 to access this place and the view is just phenomenal. Depend on the intensity of the light, the canyon cliff displays different colors. At the bend, Colorado river also takes a green to dark blue coloration. 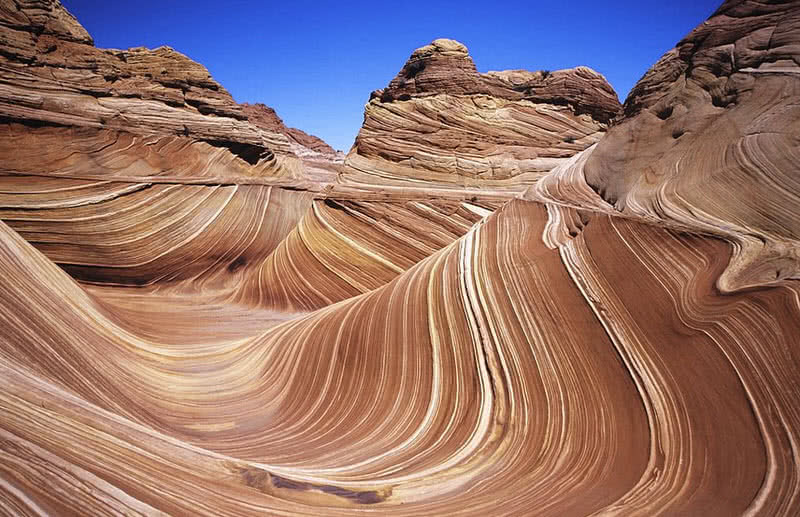 The wave is a visually surreal sandstone formation located on the Utah/Arizona border. The wave is called so because it is a colorful wavelike formation on the sandstone in the area of Paria Canyon-Vermillion Cliffs Wilderness. This spectacular geological formation formed by millions of years of wind and rain erosion. Today, it is among the most photographed places in the United States. The wave is actually a magical combination of interesting shapes and breathtaking colors. The wave-like formations on this site display a different spectrum of colors, ranges from red, pink, orange, yellow and green. Depending on the time of the day, it appears in different colors. This color change merely depends upon the intensity of Sunlight. The grand prismatic spring is a stunningly colorful hot spring located in the Yellowstone National Park in Wyoming. At a depth of 121 feet and a diameter of 370 feet, the grand prismatic spring is the largest hot spring in the United States. 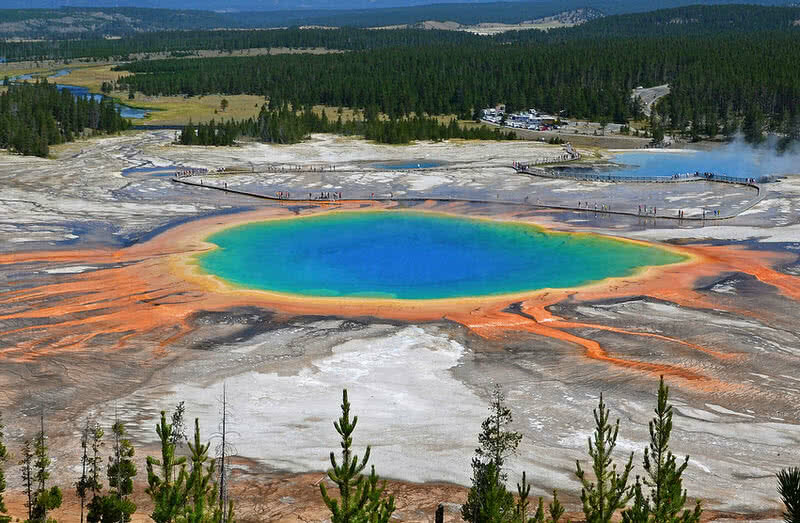 The brilliant coloration is one of the most distinguishing factors of grand prismatic hot spring. The mineral rich, deep-blue colored water of this hot spring is lined with patches of vibrant red, yellow and green. The magnificent coloration on the edges of grand prismatic hot spring is caused by the presence of pigmented bacteria. They can thrive in the high temperature of the hot springs. But no form of life present in the center pool due to extreme heat which can reach temperature around 87 degree Celsius. 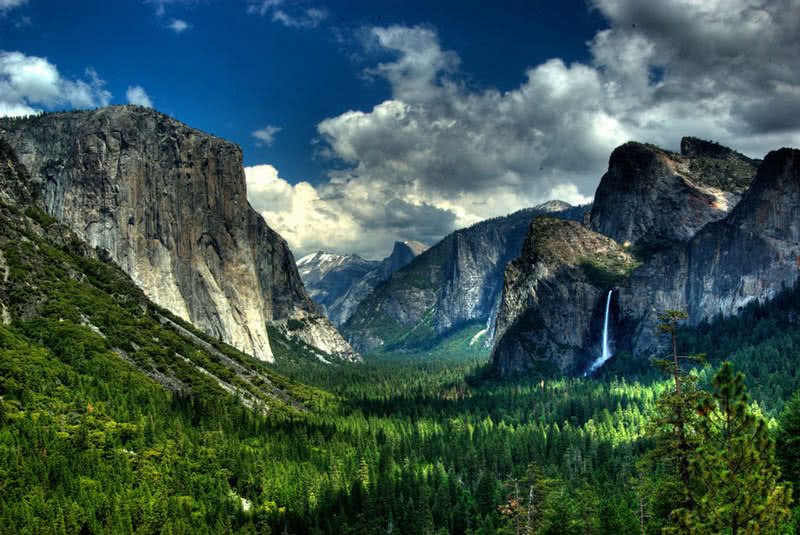 The Yosemite valley located in the Northern California is nothing shorter than a paradise. Because the attractions are endless at the Yosemite valley. It is the most beautiful part of Yosemite National Park and home to amazing waterfalls, spectacular cliffs, and rich wildlife. 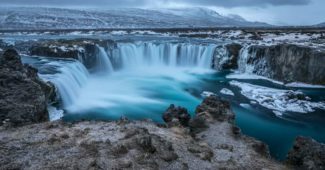 This magical valley was carved by glaciers around ten thousand years ago. It is 7 miles long and about 1 mile wide. The world famous EI Capitan Half Dome are situated in the Yosemite Valley. The 3000 feet high EI Capitan is among the most photographed and climbed rocks in the world. Some of the most beautiful waterfalls of Yosemite National Park such as Yosemite Fall, Vernal Fall, Nevada Fall and Bridalveil fall are situated in the Yosemite valley. The 2425 feet high Yosemite Fall is the highest waterfall of Yosemite National Park. The tunnel view on State Route 41 is the most scenic viewpoint in the Yosemite National Park. From this point, you can enjoy the breathtaking beauty of Yosemite valley. From here, you can see some famous landmarks of Yosemite National Park, including EI Capitan, Bridalveil fall, half dome and sentinel rock.